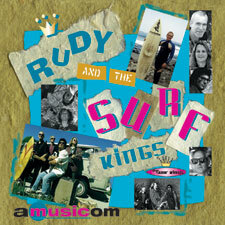 Based in Los Angeles, Rudy and the Surf Kings are part of the re-emerging California surf scene whose unique sound inspired the soundtracks of such films as Quentin Tarantino's Pulp Fiction. The Surf King's blistering guitars and romantic surf ballads have been heard from Muscle Beach to Big Sur. Hang Ten on the big wave coming to you from Amusicom- Cowabunga dude!